For some reason, a diaper bag was one of the last things I bought and eventually struck out from my baby list. But then I realised I wasn’t alone; my friend and I were pretty torn on which to go for. I had so many requirements I wanted it to tick. First it had to be quite spacious. I’d made up my mind that contrary to the understandable actions of many first time mums, I wasn’t going to lug the whole kitchen sink into a diaper bag and risk hurting my arms and shoulders (which meant the diaper bag on its own had to be pretty light weight). But at the same time, we know that with a baby – the little necessities add up. Asides being spacious, it also had to help keep me organised. I won’t lay claim to being the most organised person (and anything to help as a new mum was a plus). So it would have been utterly useless to have a really spacious deep holed bag with no compartments which help keep things in place. Separate storage was important - baby food had no business being in the same space with soiled diapers. Next, it had to be sturdy and quite well made. I find that these days I’m more inclined to pay a little more if that means I wouldn’t have to buy the same things over and over. And speaking of well made, having gone through a few reviews online I wanted the extras that often came with a diaper bag – one of which was a changing mat! I thought it was pretty cool to have a permanent changing mat for the bag only. Still on the list – practicality. As a new mum, particularly when you’re out and about pushing a pram or buggy, it’s super helpful to have your hands free and so I wanted that whatever kind of diaper bag I settle for is able to clip or attach to a buggy in some way. It also had to be easy to clean – and trust me that’s a general lesson with babies. Everything should be easy to clean if possible. Finally, it had to be multi purpose. If I could use it for more than one thing, that would be an absolute winner. So we decided that we wanted a diaper bag that both Tee and I could use. Therefore we didn’t want it very “mumsy” – and we wanted something we could both use. And so we thought we got something that pretty much ticked all of our boxes. But then here’s what happened – I realised that every time we had to go out, we had a diaper bag all packed nicely, but I still ended up with an extra bag for myself: my wallet, keys, makeup, etc. Because you know, new mummy still needs to look cute sometimes. And I probably do not need to tell you that carrying two separate bags: one for mummy and one for baby is not very practical. It is manageable when I’m with Tee and we’re driving as I just chuck everything in the car (and he carries the main diaper bag) but when I’m alone… pretty clumsy! So in retrospect, I’ve realised that every mum needs a diaper bag that indeed ticks off all of the above. But when it comes to multipurpose bags, it would be a great help and totally fabulous if she could have a diaper bag that doubles as her regular handbag, purse or tote! Imagine no one having to know the difference. You get to have all your baby’s stuff in one place and also all of your stuff! Others include water, pacifier, baby toy. For mums: wallet, keys, cell phone, a little makup bag for touch ups and well, sunglasses to shieled those eye bags in the early months. One way I stay organised is to have our diaper bag permanently packed with most of these essentials and I only refill when it gets low (ie. Diapers). Sample sizes work absolutely great for items like nappy creams and sanitisers if regular sizes are too bulky. Also, it’s very okay to have two types of diaper bags that suit your purpose. It could be a tote like one for shorter trips and a back pack for longer trips. For travelling with a baby, a back pack is probably recommended - to free up your hands. 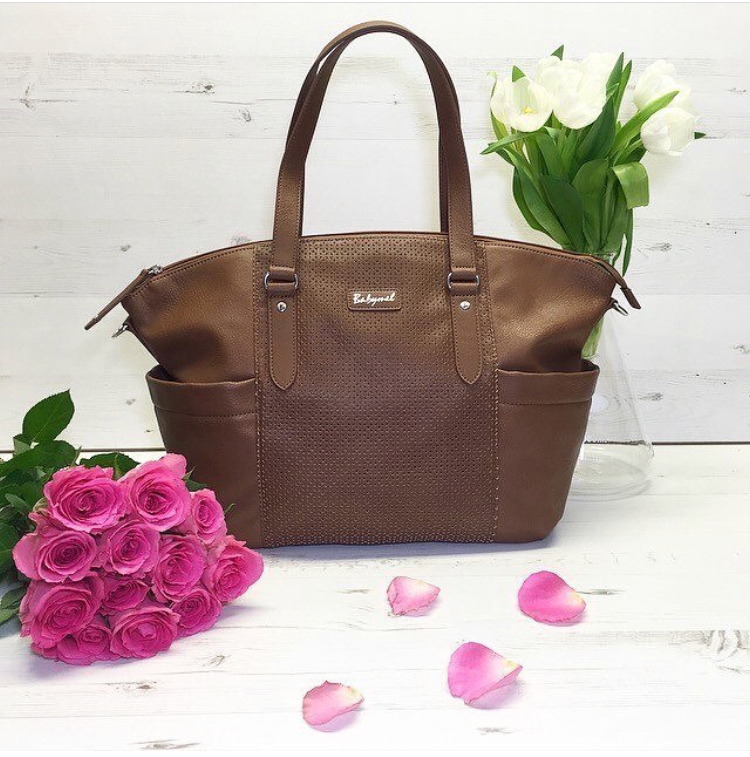 So you don’t have to struggle with two bags as I initially did, I’m collaborating with Baby Mel London who have a wide range of amazing diaper bags to give out this super cute Anya Tan tote diaper bag (pictured above) which currently retails for £65. Would you even know this was a diaper bag if I didn’t say? It’s made of faux leather, stylish design and with multiple compartments. It is lightweight, comes with a changing mat, with stroller straps to attach to your buggy. Finally, its tan colour is such a classic - great mix of style + practicality. To enter, simply leave a comment saying why you want it and we’d pick a winner (deliverable to the UK only). Over to you now! Any diaper bag stories? What style do you recommend and what are the must have items - Did I miss anything?